There is a common misconception that public relations is a crap shoot – that is, publicists sit in front of their computers all day long, sending out press releases in hopes that something will stick and end up in the New York Times. Here is a news flash – it really doesn’t work that way. PR is and always will be about building relationships with the press and telling a great story in a way that perfectly captures the value you provide. The only way to get there is with a proper PR strategy instead of a “shoot from the hip, fingers crossed” approach. Here are some things to consider. What is your plan? PR planning works best when the right messages flow directly from a firm’s strategic and business goals. What are the key practices, attorneys or initiatives that are priorities right now? What are the key messages? This, of course, may change over the course of the year and your PR plan should be recalibrated accordingly, but most of this information should be hashed out with some key goals in place before the first pitch is delivered. Who is the audience? Creating a list that is made up of media that will have limited or no influence over your target audience is a waste of valuable time and money. Who are your clients and how do they consume their news? You may find that a key industry trade publication has just as much impact on current and potential purchasers of your service as a major daily newspaper. A quote in New York Times is great, but coverage in Platts, for example, may have greater impact for an attorney who focuses on the energy sector. When you consider the media, consider the audience you are ultimately trying to reach. What are the tactics? At the very least, your PR plan should include an effective mix of expert commentary, bylined article placements, speaking engagements, legal rankings and social networking. You can also establish your own editorial calendar of specific events that you know happen each year. This will give some specific structure to your media outreach and allow you to take advantage of key milestones throughout the year. Save your luck for Vegas. Sit down with your PR support person and, together, you can eliminate random acts of PR so your firm can enjoy the benefits of a well-developed and well-executed plan that will buoy the firm’s brand. 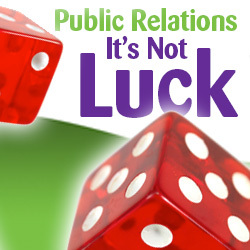 For more information on developing an effective PR strategy, please contact Vivian Hood at vhood@jaffepr.com.